People have widely disparate impressions of what constitutes the 1%. Okay, here’s what I always like to see. 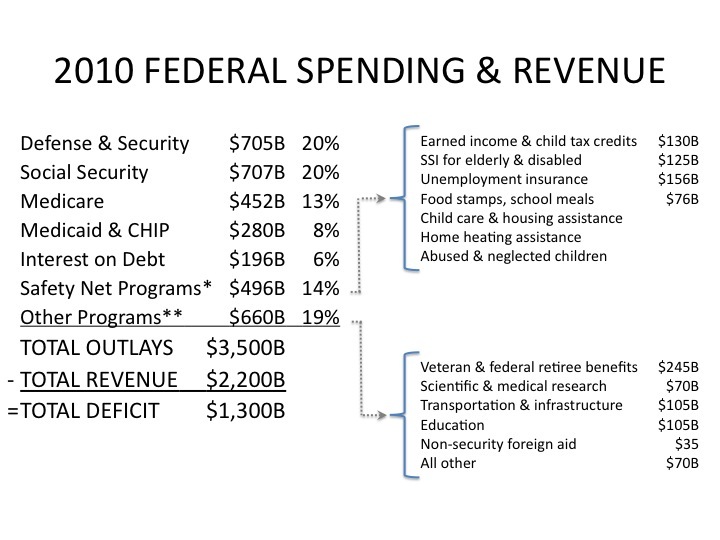 These numbers are gathered from official IRS data for 2010 by Emmanuel Saez, Professor of Economics at Cal-Berkeley. To help you interpret, columns 1 & 2 show you that, if you made $108,024 in 2010, you were in the top 10%. If you made $150,400, you were in the top 5%. To be in the top 1%, you had to earn $352,000, and so on. Columns 3, 4, & 5 tell you that there were a total of 156,167,000 households that filed returns, 140,550,300 of whom constituted the bottom 90%. The average income overall was $51,550 and for the bottom 90%, it was $29,840. The bottom half of the top 10% (10-5%) had 7.8 million families with an average income of $125,627. The four percent just above that had 6.2 million households averaging $205,529. In the bottom half of the top 1% were 780,835 families averaging $798,120, and so on. Now, here is a graph by Arizona Political Science professor, Lane Kenworthy. 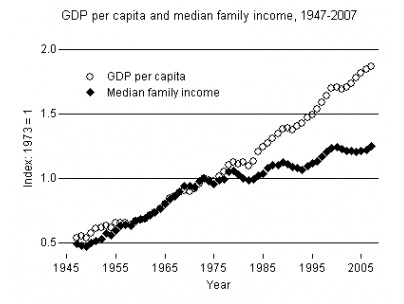 It shows how both GDP (Gross Domestic Product) and median family income have grown since 1947. Note that up until about 1980, income growth pretty well tracked GDP growth, but has not kept pace since (remind me again who became president about that time?). 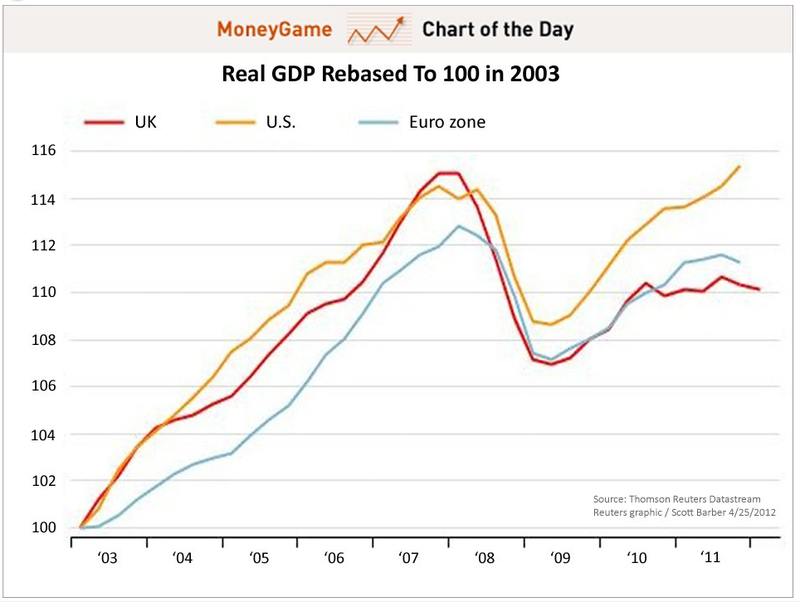 Since GDP has continued to grow, SOMEBODY is making money, so where has all that money gone? And here’s a chart from Mother Jones magazine. It shows how much income has been gained or lost by various income groups owing to the failure of Middle Class incomes to keep pace with GDP growth. 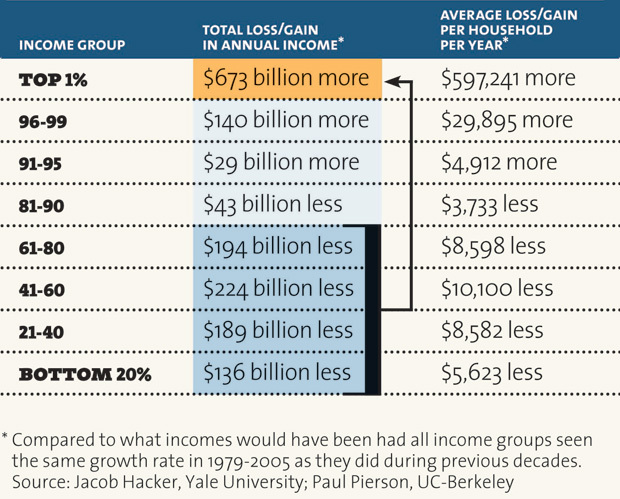 Note how the amount lost by the bottom 80% compares with that gained by the top 1%. The wealth still being generated by this country’s economy is no longer accruing to the people who do the work to generate it. Rather, it is going to a few extermely well-to-do people at the very top of the income scale. Either we’re going to do something about that or it’s going to become the status quo. It’s our choice. (Mike Konczal) In recent months, some commentators wondered whether the national conversation over inequality was coming too late. Early data suggested that the top 1 percent’s share of national income had dropped from 23.5 percent to 18.1 percent in the early years of the recession. “We don’t want to spend years focused on income inequality, only to learn that the financial crisis fixed it for us,” wrote the Atlantic’s Megan McArdle. In the first year of the recovery, 93 percent of all income gains went to the top 1 percent. In other words, the very rich had a bad 2009, but an incredible 2010. Their share of national income bounced back to 19.77 percent. So inequality is marching upward once again. And there’s reason to believe this will keep going. We mainly talk about income inequality, but wealth inequality matters, too. For most households, their wealth is in real estate. Those assets aren’t returning to pre-crisis levels anytime soon. But for rich households, their wealth is in financial assets, and those assets are recovering much more quickly. Here’s more from Mike Konczal. These roughly equate to Medicare, Medicaid, Social Security & interest on the debt, which compromise 49% of federal spending and all, like housing & food, are basically unavoidable. These roughly equate to federal discretionary and non-entitlement mandatory spending, which make up 31% of federal budget. It’s basic O&M, cutting it is doable, but seriously short-sighted and unwise. Roughly equates to Defense, 20% of federal budget. There is some room for cutting, but even cutting it ALL won’t fix the problem and would be kind of like walking around naked and with no shoes. So, the family takes in $21,700 and spends $38,200 annually. What are you going to cut from that family budget so you can cover its needs AND pay down that debt, Einstein? Answer: You’re not. You can’t. It simply costs too much to properly house, feed and provide for the family to solve the problem simply by cutting spending. You’re going to have to get some of the people in that house who are not pulling their weight to contribute to the family income. It’s the same problem we have as a country. Okay, you say, let’s cut Medicaid. After all, that’s just welfare for people who can’t afford to pay for their own medical expenses, right? Fine. If this hypothetical family was apportioned by age the same as the U.S. population, there would be two adults aged 30-54, two children aged 15-23, one child under 14 and one adult over 65. Most Medicaid goes to poor children, nursing home care and people on life support. Cutting it would be like deciding not to spend money on the youngest kid’s insulin treatments, unplugging the life support of one of the adults or throwing grandma out into the street. Pick one. The 1% and its apologists are fond of making this a choice between freeloaders and hard working people. It’s not. It’s a choice between really RICH people and the rest of us. It’s a choice between greed and need. Pick a side. But be careful. Someday you might be the one who needs insulin treatments, nursing home care, life support or be the grandma or grandpa who kicks kicked to the curb. Your choice.